An angel who identified himself as the angel of Peace appeared first to the three shepherds of Fatima; they were prepared by the angel before the apparitions of Our Lady about a year later. The three children were Lucia dos Santos, age 9, and her cousins Francisco and Jacinta Marto, ages 8 and 6 respectively. The 13 of May of 1917, Our Lady appeared to three little shepherds, for the first time and the apparitions took place on the 13th. of the month for the next 8 consecutive months. Our Lady requested the children to pray the Rosary and to make reparation for poor sinners. They were given a vision of hell, and on the last apparition Our Lady revealed herself as the Queen of the Rosary, there were about 70.000 people on the day of the last apparition in October, there was a great miracle of the sun and many people converted and received healings. Our Lady requested that a Church was built there. 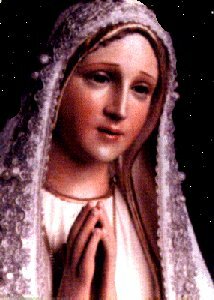 The message of Fatima is the message for this century, it calls for Repentance, Penance, conversion and devotion to the Immaculate Heart of Mary. Our Lady made several prophecies, including a secret message which is kept at the Vatican. There is a great basilica in Fatima Portugal, where millions of people come yearly to pay tribute to Our Heavenly Mother and to request her intercession before her Son. Sister Lucy is still alive and She received further messages from Our Lady, one which is the devotion of the five first Saturdays for five continuous months in reparation for the offences committed against Her Immaculate Heart.